Portland CC Saturday Quads (Dec 5); Yakima Saturday Quads (Dec 5); Seattle CC Sunday Tornado (Dec 6). WA Class! The annual Washington Class Championships were held Thanksgiving weekend, November 27-29. See a report, list of prize winners and some photos. Other November events: Portland Game in 60 (Nov 21) – Steve Breckenridge won 4-0 in a 16-player field, pushing his USCF rating to 2196. Tacoma Economy Tournament #3 (Nov 21-22); Jack Taylor Swiss, Victoria, B.C., Canada (Nov 21-22); Seattle Saturday Quads (Nov 14); Uncles Chess Tournament in Spokane (Nov 14); Tacoma Library National Game Day Open (Nov 14); Oregon City Tornado (Nov 14); Seattle Chess Club Novice (Nov 15); Seattle CC Extravaganza (7 Rd G/90, Nov 6-8); Portland Saturday Quads (Nov 7); Seattle Sunday Tornado (Nov 1). Portland Game in 60 (Oct 31) – Steve Breckenridge scored 4-0. 21 players took part including two unrateds. Neil Dale took care of the director duties. 6th Spokane G/10 (Oct 31) – congratulations to John Julian, 1st overall; Western States Open Chess Tournament (Oct 23-25) in Reno, NV; Yakima Chess Club Saturday Quads (G/90) (Oct 24) in Yakima, WA. 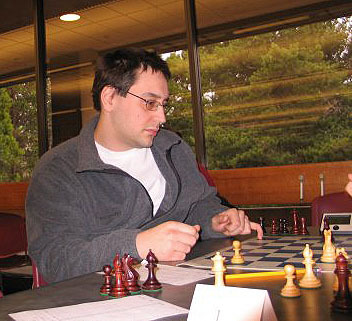 The 2009 Portland Chess Club Championship was won by Carl Haessler of Lake Oswego, Oregon with a 4.5/5.0 score. The eight-player Swiss took place in Sept./Oct. 2009. Nick Raptis was second. Portland Fall Open (Oct 17-18) in Portland, OR. 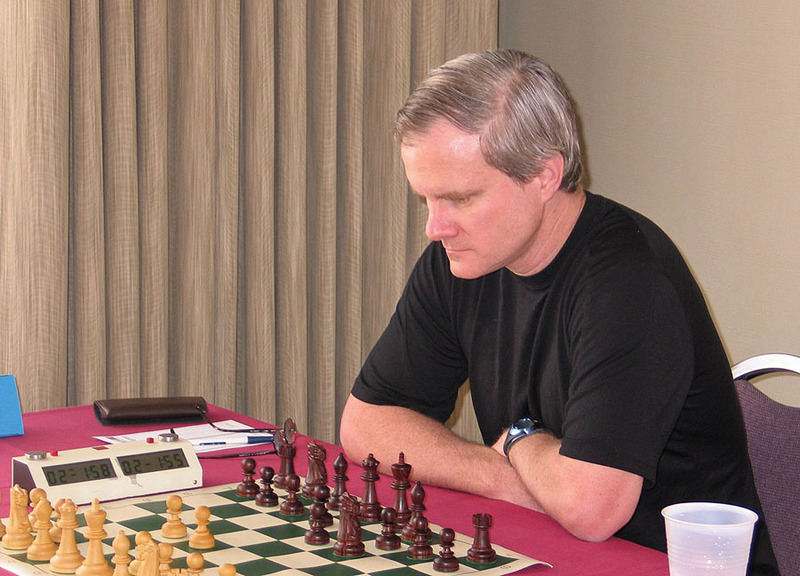 Rusty Miller's report: The Portland Fall Open was held at the Portland Chess Club, drawing 28 players in two sections. 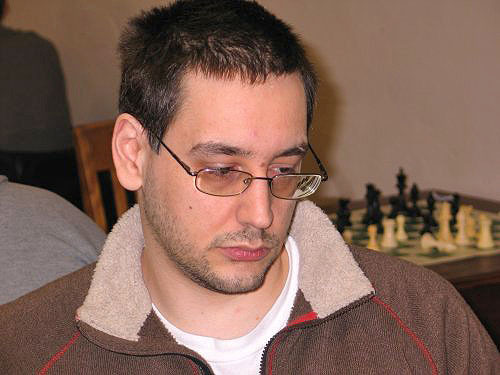 Radu Roua of Portland won the 17-player Open Section 4-1, three wins and two draws. Nick Raptis and Daniel Gay were among the players with 3.5. Neil Dale as usual directed the event. Photo: Roua (left) competes against Raptis (right) beneath some of the club's chess artwork. See Rusty's photos on Flickr. Puget Sound Open (Oct 17, changed to one-day event) in Tacoma, WA. FM Paul Bartron won the event 4-0. Only seven players took part. Seattle Saturday Quads (Oct 10). Clackamas County Senior Chess Championship (Oct 10). Rusty Miller's report on the senior event: "Small turn out of 10 players. Larry Ball won the event. Site worked out well. Next event there is Nov 14th. Several players had not played tournament chess for several years. Thanks to Russell Miler, Frank Niro and the chess club everybody won a prize: WCF or OCF membership, chess books, t-shirts and tote bags. Event will be USCF rated." 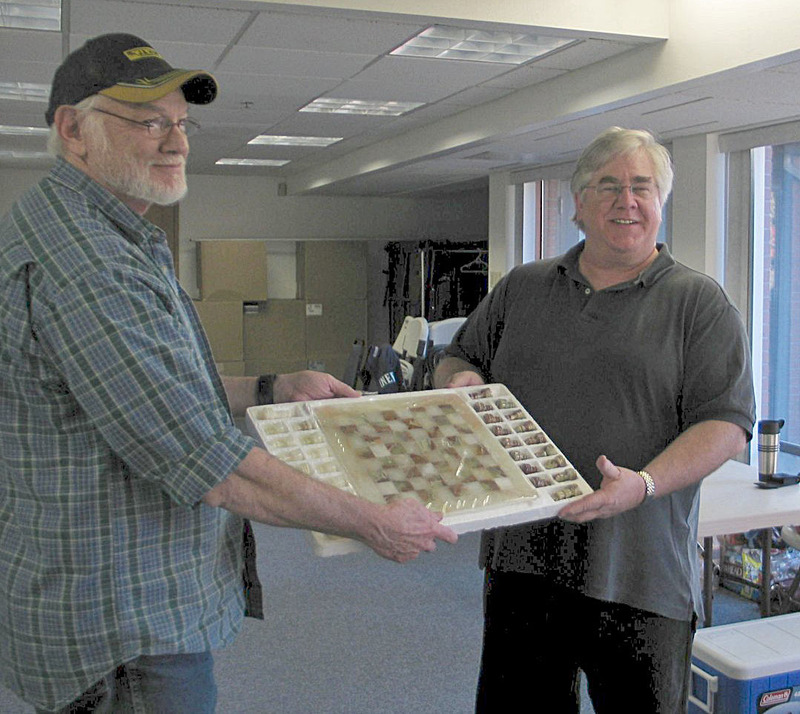 Photo (left): Brian Berger presents 1st place prize to Larry Ball (on the right). Photo (right): Frank Niro on the far left, Carl Koontz, Rusty Miller, Larry Ball, Brian Berger with the frame in his hands, ?, Neil Dale, Bill Gagnon, Ed Addis, Kathy Miller, John Smith. Credit: Frank Niro's wife. The Silverdale Beach Hotel Classic (Oct 10-11), Silverdale, WA. Report by Hanniegn Pitre: A success for a first time tournament effort on the Kitsap peninsula area. Rousingly applauded by the many who participated and enjoyed playing in a fine resort-like site. Players came from as far as Victoria and Portland. Port Townsend, Olympia, Bremerton, Poulsbo, Bainbridge Island, Port Hadlock, Redmond and Seattle were represented as well. Thirty players in all; the organizers were hoping for fifty. When you hear about it in NWC magazine in the future you'll want to participate in the next year's event which we intend will be bigger and better. Look for games, analysis and stories to come in a future issue of NWC. ... New participation and recognition for the Kitsap County Chess Club which operates in Bremerton, and is the affiliate for the USCF rating of the event. Organizers: Richard Golden and H.G. Pitre. The winners: Open: 1st Viktors Pupols, 2nd Roger Patterson, 3rd William Schill; Premiere: 1st Stephen Buck, tie 2nd, 3rd, & 1st under 1700 Kristen Dietsch, Jiayi Hu, Ethan Bashkansky; Reserve: 1st Dennis McGuire, 2nd Kaicheng Hu, 3rd Laura Jacobson, tie 1st Unrated Romy Garcia, Isaias Origel. See story/photo in the Kitsap Sun newspaper. Campbell Center Open, Eugene, OR (Oct 3); Portland Saturday Quads (Oct 3); Washington G/60 and G/30 Championships, Tacoma, WA (Oct 3-4); Eastern Washington Open, Spokane, WA (Oct 3-4); Seattle Sunday Tornado (Oct 4); Seattle Fall Open (Sep 25-27); Portland Game in 60 (Sep 26) – congratulations to winner Ken Frojen with a perfect 4.0 score; Tacoma CC Tornado (Sep 19); Portland Saturday Quads (Sep 19); Southern Oregon Open in Grants Pass (Sep 19-20) – congratulations to winner Corey Russell; Mega-Chess in Tacoma (Sep 20); Seattle Saturday Quads (Sep 12); Tacoma Economy Tournament (Sep 12-13). Nick Raptis of Portland, OR won the 58th Annual Oregon Open with a score of 5.5 out of 6. He was kept from winning the perfect score prize by a draw in round 5 with Steve Breckenridge of Oregon. Tied with 5-1 scores were Alex Guo of Washington and John Chung of Oregon. 52 players took part in the Open Section. The Reserve Section (U 1800) had 58 players and ended in a three-way tie at 5-1 among Oregon players David Bannon, Galen Pyle and Jason Cigan. 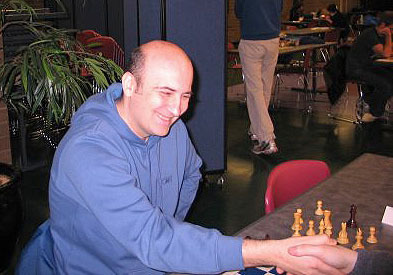 The Portland Chess Club was the sponsor and the event was held at the Mt. Hood Community College in Gresham, OR over Labor Day weekend (Sep 5-7). Neil Dale of Portland was the tournament director. The total attendance of 110 players was up from 88 players in 2008. Photo: Playing room at the Oregon Open. See more of Rusty Miller's photos on Flickr. For those farther north, there was also the Langley Chess Club Labor Day Weekend Open (Sep 5-7) in Langley, BC, Canada. Portland CC Game in 60 (Aug 29), Washington Senior Adult Championship and Washington Women's Championship (Aug 29-30) in Tacoma, Seattle CC Tornado (Aug 30). In the Portland G/60, Nick Raptis and Bill Schill tied for 1st with 3.5/4. They drew each other in round 4. 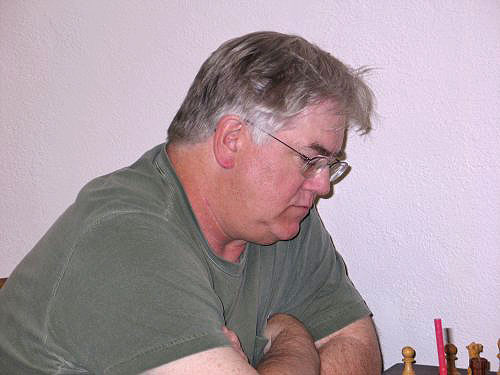 In the WA Senior, Paul Bartron won with a perfect 4-0 score in an 8-player field. Oregon Class Championships (Week 2, August 8-9) in Portland. See PDF flyer. Also: August Ajeeb (Quads) in Spokane (Aug 6, 13, 20), WA Blitz Chess Championships at Crossroads in Bellevue (Aug 8), Tacoma Open in Tacoma (Aug 8-9). The Blitz Chess Open Champion was John Readey, scoring 11.5 out of a possible 14 points, followed by 2nd place David Wyde scoring 10.5 out of 14. The Washington State Junior Speed Chess Champion is Megan Lee who scored 8 points. Winner! Chess master William Schill of Kirkland, WA recently traveled to Portland and Spokane, winning two events – the 3rd Spokane Falls Open (Jul 18-19) and the Portland Summer Open (Jul 11-12). In the Spokane Falls event, he scored 4.5 out of 5.0, topping Marc Havrilla (4.0). In the Summer Open, he tied with Nick Raptis, each scoring 4.0 out of 5.0, and drawing each other. The reserve section of the Summer Open was won by James McAleer with 4.5 points. In Schill's absence, Raptis ran away with the Game in 60 (Jul 25) in Portland, scoring a perfect 4.0 points. Run/Chess Championship (Jul 25) in Newport, OR. 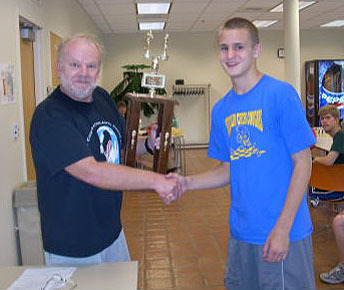 Photo: Calvin Parnon (right) receives the Run/Chess trophy from organizer Bill Barrese (left). 21 people ranging in age from nine to sixty-two competed in the event. Each contestant ran or walked a timed mile. The time that each person recorded was the time each of their opponents had in a five-round chess tournament. The winner of the chess tournament was declared the Run/Chess Champion, with Calvin edging out Drew Coughlin on a tie-break. Other July events – Seafair Open (Jul 24-26) in Seattle; BC Open (Jul 24-26) in Victoria, BC; Summer Chess Fest (Jul 20-21) in Victoria, BC; Saturday Quads (Jul 18 in Seattle and Portland); Evergreen Empire Open (Jul 11-12), Tacoma, WA; Sammamish July Swiss (Jul 12), WA. Seattle Chess Club Sunday Tornado (Jul 5). 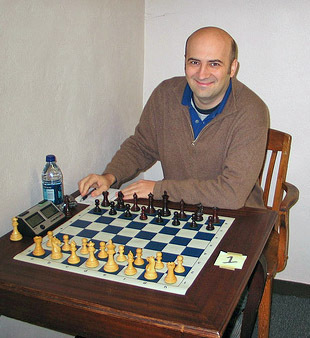 GM Varuzhan Akobian lecture/simul (Jun 27) in Bellevue, WA; Portland CC Game in 60 (Jun 27); Qualchan Quads (Jun 27) in Spokane, WA; Northwest Open Economy Only Tournament (Jun 27-28) in Tacoma, WA. Emerald City Open (Jun 19-21) in Seattle, WA and Newport June Open (Jun 20-21) in Newport, OR. 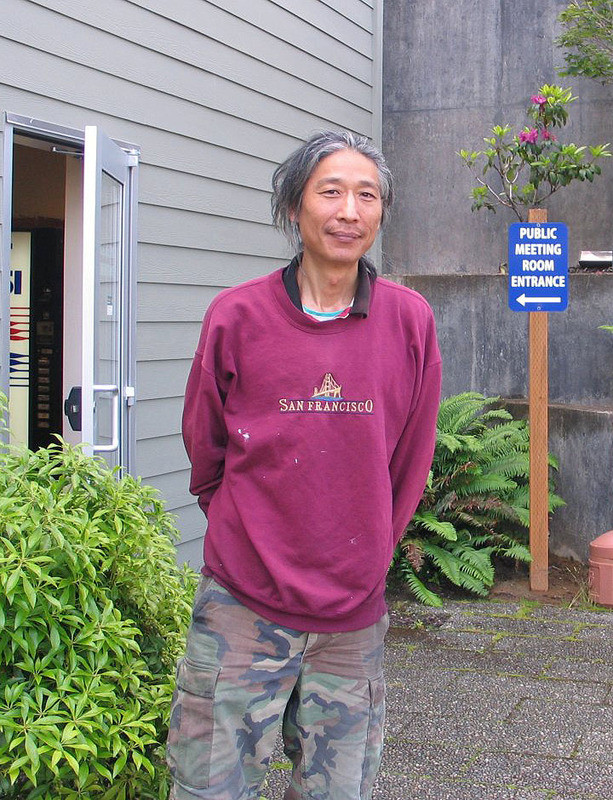 In the 25-player Newport event, John Chung of Waldport, OR took the top spot on tie-break. He and Paul Motta of Bend, OR both scored 4.5-.5. They each won $85.50. The next Newport competition is a "Run/Chess" event on July 25. Photo: John Chung. (Credit: Rusty Miller.) More photos. Seattle Chess Club Saturday Quads (Jun 13), Sammamish June Swiss (Jun 13). 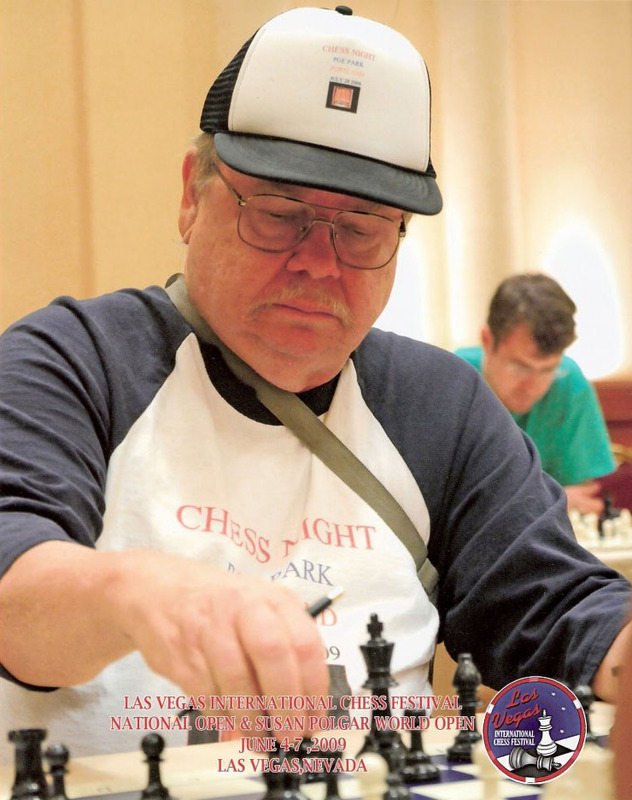 Rusty competing in the National Open, wearing Chess Night shirt and cap. 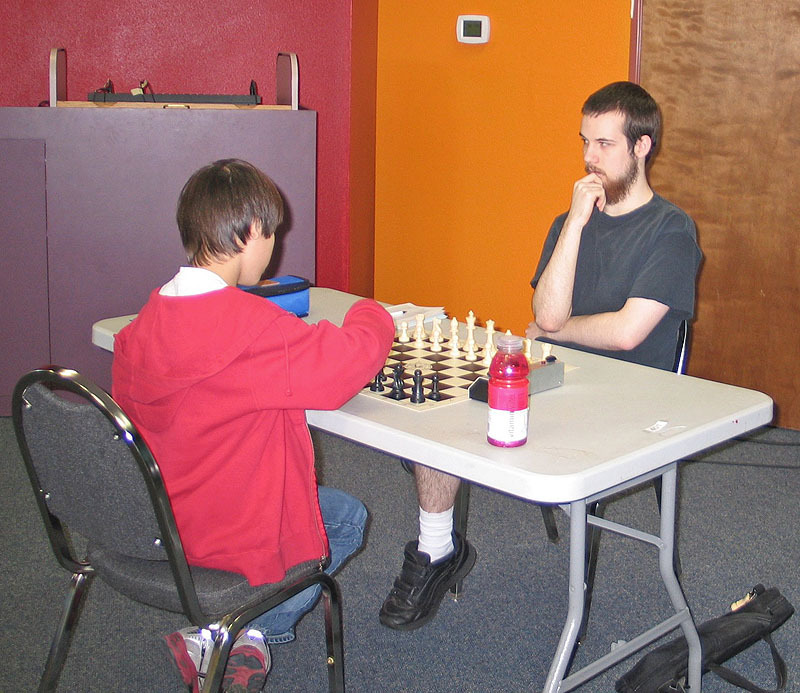 24 players of all ages attended the May G/60 event at the Portland Chess Club. As usual National Master Nick Raptis of Portland finished first or tied for first; this time he scored an undefeated 3 wins and a draw, a score matched by Steven Breckenridge. Master Radu Roua of Portland drew with both Raptis and Breckenridge for a 3-1 score and a tie for 3rd-5th with Richard Banner of Camas and Scott Levin. Raptis won some cash plus a ticket to Chess Night at PGE Park on July 28 for the Portland Beavers Baseball Game. See Rusty Miller's photos on Flickr. Washington Open in Spokane (May 23-25) – $8,000 in guaranteed prizes!! (Prize list available on linked page.) The annual Washington Open drew 103 players in three sections over Memorial Day weekend. It was held at the Red Lion Hotel in Spokane, WA, the first WA Open held in Spokane since 1956. 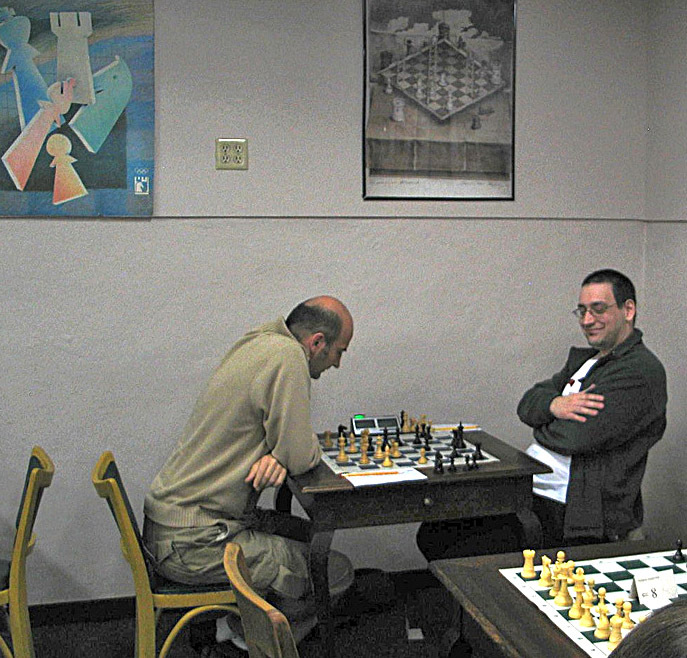 IM John Donaldson of San Francisco (photo at left) won the Open with 5 points from 6 after Curt Collyer of Spokane forced a draw by repetition shortly after the parties made the first time control in round 6. Josh Sinanan of Seattle and Nick Raptis of Portland drew their 6th round encounter to tie for second with 4.5. They were joined by Steve Breckenridge and Howard Chen who won their last round games. There were 29 players in the Open section. The Premier section was won with 4.5 points of 6 by Daniel Copeland, Ethan Gottlieb, and Robert Herrera in a 32 player section. The Reserve section was won by Ryan Ackerman with a 5.5 score. Siva Narayanan was second with 5.0. The Booster section was swept by Shanglun Wang with a perfect 6.0. See the Spokane Chess Club website for cross tables and more photos. – Report by Russell Miller. See photos of the event by Russell Miller. 34th Paul Keres Memorial (May 15-18) in British Columbia, and Seattle Chess Club Saturday Quads (May 16). The 2nd Green Open (May 9-10) at the Seattle Chess Club. 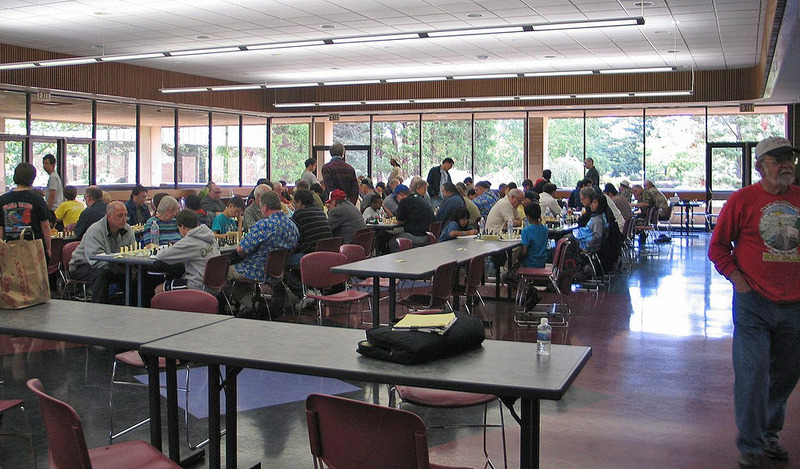 Seattle Chess Club Saturday Quads (Apr 25), Third Annual Clark Harmon Memorial at the Portland Chess Club (Apr 25-26); also WA State Elementary Chess Championships at the Spokane Convention Center. See the results and crosstables from the elementary championships. The Harmon Memorial tournament ended in a tie between Nick Raptis and Steve Breckenridge when both scored 4.5-0.5. 38 players took part in the event directed by Neil Dale. 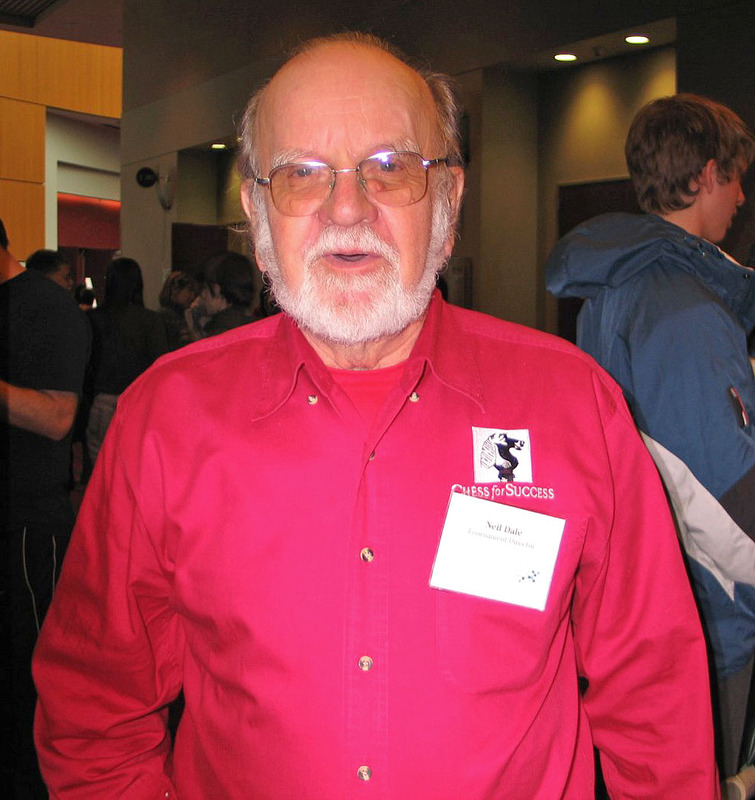 The event is named for Clark Harmon, many time Oregon Chess Champion who played in and organized chess events starting in late 1950's in Oregon and Washington. Photos: Radu Roua prepares for action on board 1 (left); Steve Breckenridge (right). Photo by Rusty Miller. See Rusty's photos on Flickr. The 2009 All Girls Open National Championship (April 24-26 in Dallas, TX) winner was 12-year-old Megan Lee of Washington. She was awarded an Academic Distinction Scholarship from the University of Texas at Dallas, and got her picture on the cover of the June Chess Life for Kids published by the USCF. See story/photo on USCF website (registration may be required). Daffodil Open (Apr 18-19) at the Tacoma Chess Club. Easter Weekend! There were two major national events in western North America (one in US and one in Canada) Easter weekend – 9th Annual Sands Regency Reno - Far West Open (Apr 10-12) and Grand Pacific Open, Victoria, BC, Canada (Apr 10-13). 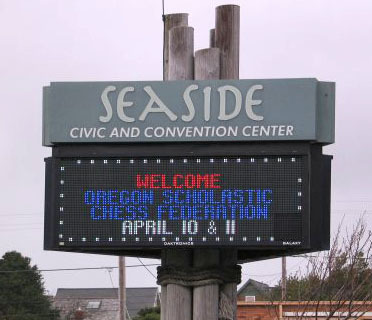 The Oregon Scholastic Chess Federation championships were held April 11 at the convention center in Seaside, Oregon. See Rusty's photos on Flickr. For more info, see http://www.oscf.org/. Inland Empire Open (Apr 4-5) in Spokane and Seattle Sunday Tornado (Apr 5) at Seattle CC. Seattle Spring Open (Mar 27-29) and Portland G/60 (Mar 28). 23 players took part in the USCF rated March G/60 event at the Portland Chess Club. NM Nick Raptis won this event as he usually does when he plays in the monthly G/60 event, although this time he shared first place with 1753-rated Ken Frojen. Both players had perfect 4.0 scores and did not play each other due to the size of the field. In 2008 Nick won the PCC G/60 outright six times and tied for first two other times. WA State Susan Polgar Qualifier (Mar 21-22). Congratulations to Alexandra Botez from Blaine, WA for winning 1st place with a score of 3.5 out of 4! Svetlana Grabar took 2nd place and will be the alternate. Photo (left to right): Heather Young, Svetlana Grabar, WA scholastic coordinator David Hendricks, Alexandra Botez, Sarah May. Portland Spring Open (Mar 21-22). Congratulations to NM Nick Raptis (left) with a 4-1 score, losing to 2nd place finisher Larry Ball (right) of Portland in round 1. The open section of the tournament only drew nine entrants. The reserve section had 12 players and was won by Kevin McKee, also at 4-1. 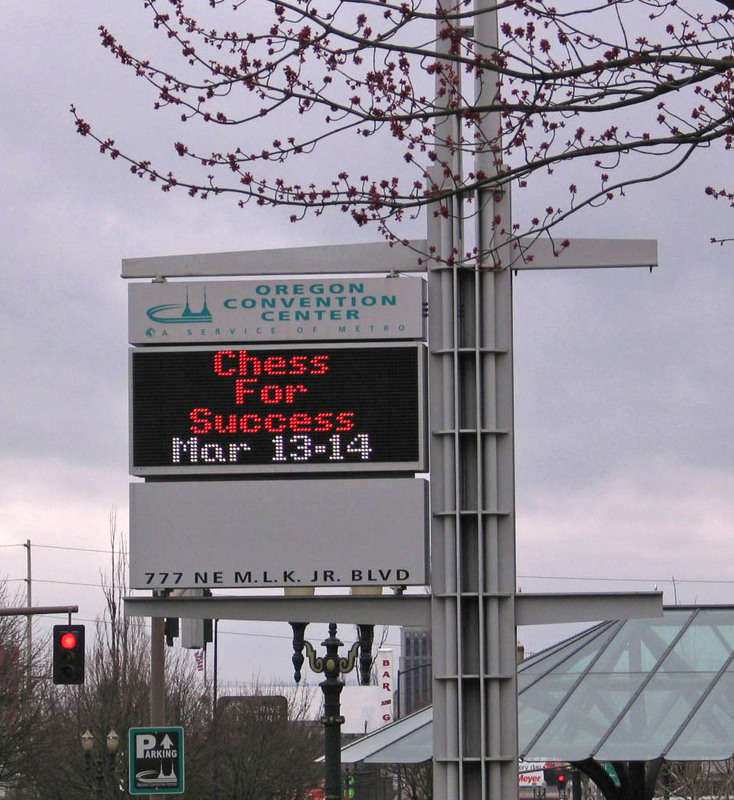 The 42nd annual Oregon state scholastic championships, hosted by Chess for Success, were held March 13-14 at the Oregon Convention Center in Portland. 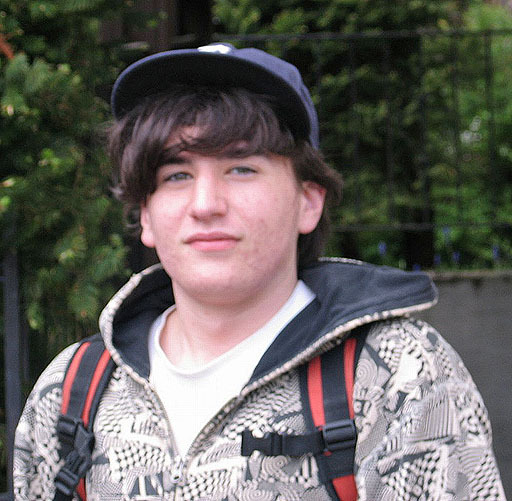 Nathan Porter of Lake Oswego won the 24 player high school section with a perfect 5-0 score. There were middle school and elementary school sections with a total of about 550 players. Right: Tournament director Neil Dale. Photos by Rusty Miller. See Rusty's photos on Flickr. Seattle Saturday Quads (Mar 14), Northwest Open in Tacoma (Mar 14-15), Grants Pass Open XXXV (Mar 14-15) in Oregon. The Cornerstone Chess Challenge was held March 7, 2009 at the Cornerstone Christian School in Vancouver, WA. Norman May of Vancouver was the tournament director/organizer. 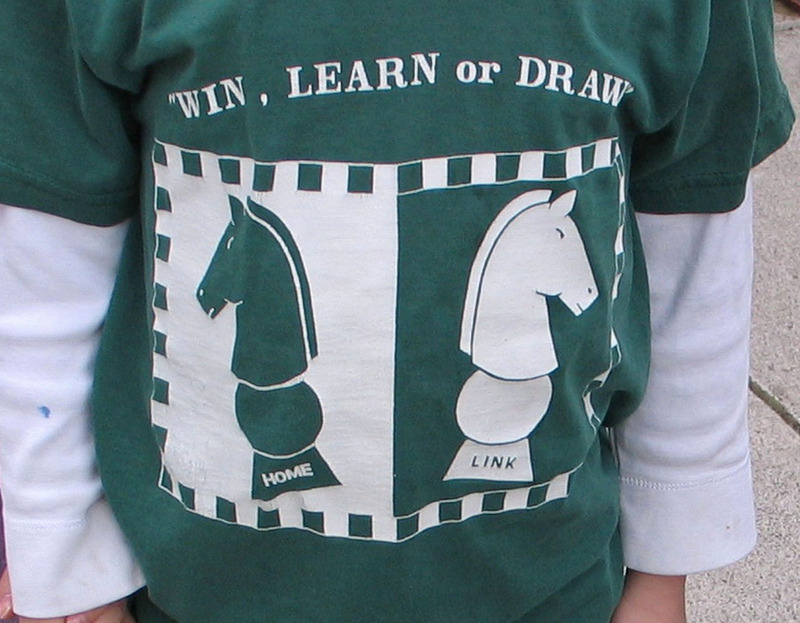 As the kid's shirt tells us, when you play chess you either win, learn (if you lose) or draw!! Photo by Rusty Miller. 17th Dave Collyer Memorial tournament (Feb 28-Mar 1) in Spokane, WA. Congratulations to National Masters Curt Collyer (Dave's son) and Josh Sinanan, topping the 63 player field with a score of 4.5. Daniel Gay held IM John Donaldson to a draw in the third round, and Collyer had a win against Donaldson! See the Spokane Chess Club's website. Photos: (left) IM John Donaldson gives simultaneous exhibition on Friday evening; (right) View of the playing room. Photo credit: James Stripes. Ackerman, Weyland Spokane Winter Champions (Jan 22-Feb 19) Ron Weyland defeated Ryan Ackerman in their fifth round encounter to tie Ryan for the title of club champion. Both finished at 4-1. Kevin Korsmo was third with 3.5. Ron and Ryan split the $55 cash prize for first place and the best over 1500. The best under 1500 prize went to Ted Baker with a 3-2 score. Ted Baker's first round conquest of Kevin Korsmo stood as the biggest upset of the tourney. Each of these winners received one-year WCF memberships as part of the prize packages. Story by Kevin Korsmo. See the Port Townsend, WA club page for a report on their recently completed Port Townsend Open Chess tournament. Of particular interest is the innovative system of flexible round times. The six-week Puget Sound Chess League competition began the evening of February 6 at the Tacoma Chess Club. This is a team competition with 3-player teams, a $5.00 entry fee, and a G/120 time control. Teams were selected the first night but subs may be needed; come join in the fun! Monthly Portland G/60 tournament (Jan 31) – Congratulations to Steven Breckenridge, winner with a perfect 4.0 score! The Washington High School Individual Championship was held in Seattle, January 30-31. The winner gets the Washington "Denker Spot" at the US Open. Rusty and Kathy Miller visited some regional Chess for Success scholastic events held Jan 31. See Rusty's photos on Flickr. Tacoma CC Pierce County Open (G/60) (Jan 24), Tacoma, WA. 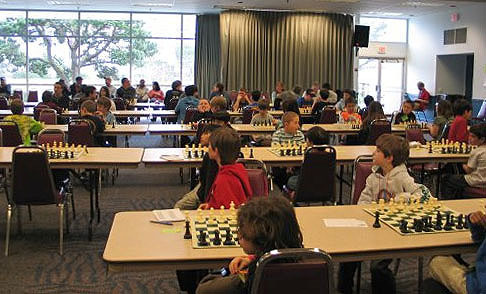 WA Junior Open and Reserve Chess Tournament was held January 19 (MLK Day) in Bellevue, WA. Seattle City Championship (Jan 16-18) at the Seattle Chess Club. The King's Way scholastic chess tournament was held January 17 in Vancouver, WA. There were 114 players in four sections. Photo: Andy May (right), winner of the top (7-12) section with a perfect 4-0 score. Andy's USCF rating is now an impressive 2144. See more of Rusty Miller's photos on Flickr. Saturday Quads (Jan 10) in both Seattle and Portland. New to chess? See our explanation of "Quads" and other terms in our Guide to Tournament Announcements. Gresham Open (Jan 3-4) in Gresham, Oregon. Photos: Left: Nick Raptis (winner of the tournament with 4.5 out of 5.0 points). Right: Radu Roua. Also see story on the Portland Chess Club website. The WA Junior Closed was held Jan 2-4, 2009. Howard Chen won it with a score of 4.5 out of 5.0, drawing second place finisher Peter Lessler. With his win, Howard Chen (now USCF rated 2063) qualifies for the state championship in February.